Thank you to all who tuned in and supported Boston Children’s Hospital through the Mix 104.1 Cares for Kids Radiothon on March 15. You help raise more than $618,000 to help kids and families—outstanding! Special thanks to our friends at Mix 104.1 for broadcasting live from the hospital, our families for sharing their stories and our volunteers for manning the phones. You made this year another success. Special thanks to our friends from Mix 104.1 for their continued support of the patients and families of Boston Children's Hospital. 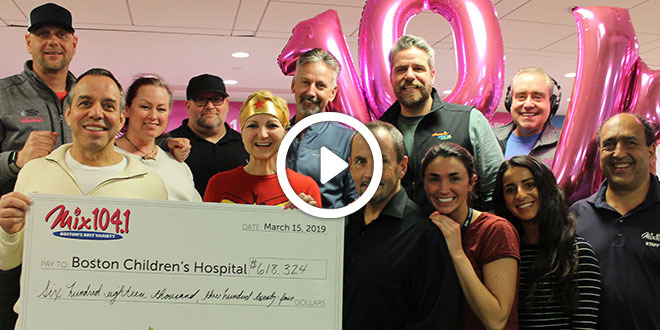 Each year, the Mix 104.1 Cares for Kids Radiothon fills the Boston airwaves with amazing stories of courage and hope from patients, families and staff at Boston Children’s Hospital. Mix deejays broadcast live from the hospital – asking listeners to call in and pledge their support by making a one-time gift or by becoming a Dream Maker (a monthly donor). Since 2003, this annual event has raised over $9.7 million to support the life-saving care at Boston Children’s! By calling 1-800-457-KIDS (5437) during the live broadcast. Families who share their stories spread hope for others and inspire listeners to support life-saving care at the hospital. Submit your story today. For more information, contact mixradiothon@chtrust.org.